Whether you call them yoga ball chairs or yoga balls, they’re designed to do the same thing, increase your core strength and improve your general well being. To get the results you have to buy one that offers maximum value for your money, and that’s where this guide comes in. 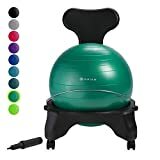 The balance ball chairs from AmazonBasics are good alternatives to the more expensive options available. These balls lead to better balance, agility, endurance, and strength. The ball is constructed of rubber that is designed to last a long time. Part of the reason why it is so effective is the non-slip surface, giving you a better grip. You can inflate the ball up to the level you want up to 75 cm, with the plug and pump coming in handy here. One of the first things you’ll notice are the horizontal lines on the ball, a deliberate choice to give you a more solid feel. Regarding versatility, the ball can be used for yoga, Pilates, CrossFit and other routines. The ball is also a good way to work out your abs, arms, glutes and other parts of your body. 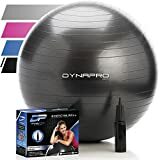 The AmazonBasics ball is also for you if you’re looking for a way to enhance your core and build up your physical strength. 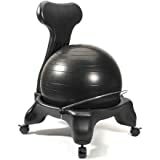 The LuxFit Ball Chair is designed for stability and strength gain. Built for home and office use, the LuxFit has a 2000 lb rating, assuring you that it’s not going to explode if a sharp object pierces it. The LuxFit comes with a workout guide that shows you how it works. What’s even better is that the ball improves your back and spine health so you’ll be more comfortable during exercise. The LuxFit is also for those undergoing spinal injury treatment and back injuries. The number of different workouts you can do here is what really gives it the advantage. 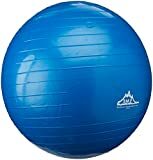 The yoga ball has a weight capacity of 300 lbs so you can put a lot of weight on it and not worry about bursting the ball. The chair itself is 22 to 25 inches high, the exact figure depends on how inflated the ball is. The chair also has sizable wheels, so it’s easy to move around. These bouncy ball chairs are designed for anyone who wants to get in shape. While it’s built mainly for home use, this exercise chair is also ideal for use in the office and gym. The included pump inflates the ball quickly but safely. The ball is designed for heavy, daily use. Its anti-burst rating is good for 2000 lbs, so you don’t have to worry about the ball exploding. While most people use it for yoga, the Wacces is also suitable for shaping up via different types of workouts. The ball also has a dynamic surface fortifies your core. The SmarterLife Exercise Ball is primarily for yoga, but it’s also for Pilates, improving posture and stability. The ball also serves those undergoing physical therapy. The ball is available in 4 sizes, 45, 55, 65 and 75 cm. Regardless of the size, you’ll get the same durable built and versatility. The ball has a 2000 lb anti-burst rating so you can do yoga, Pilates, muscle toning and CrossFit. With this, you’ll be able to build strength, improve cardio and manage your weight. With regular use, you’ll develop proper posture and learn relaxation. The ball is durable and safe too. In case the ball gets pierced by an object, it deflates slowly, not suddenly. The Live Infinitely exercise ball desk chairs have a 200 lb anti-burst rating, and that tells you how durable it is. This durability level holds true regardless of the size. Five are currently available, 55 cm, 65 cm, 75 cm, 85 cm and 95 cm. Each ball comes with a hand pump and a workout guide to get you started. The ball pumps quickly and ready to use in minutes. Made from high-quality PVC, the ball‘ s extra strong anti-burst design means it can handle a 2 cm cut without exploding. This level of thickness and protection ix hard to find in other yoga balls or chairs. The Live Infinitely is designed for all around workouts. It works great for yoga and Pilates, but it is just as potent for CrossFit, core strengthening and other types of low impact workouts. This exercise ball from URBNFit is an all-purpose equipment, good for Pilates, yoga, balance, stability, and fitness. The ball is made from PVC and is meant to withstand long-term use and for different workouts. The URBNFit package comes with an inflation pump so you can use the ball right away. It only takes minutes to pump the ball, and it’s ready to go. Once the ball is inflated, you’ll be able to use it in different ways. The ball is just the right size for home use, but it is also suitable for the office. The exercise ball makes it easier to work out your core, stomach, and glutes. You get the same results with crunches and sit-ups, only it’s more convenient. With its large diameter and rubber surface, you’ll be able to keep stability and balancing workouts. The burst resistant design also makes it ideal for heavy workouts. Some ball chairs for adults are notorious for being slow to inflate, but the Dynapro is an exception. This yoga ball rapidly inflates via the pump so you can start working out early. It takes just minutes to pump the ball and then you’ll be able to use it as a stability ball. The ball works great for yoga as well as Pilates. The ball allows you to do different workouts, and it’s especially good for your back and posture improvement. With its 2000 lb anti-burst rating, the ball can handle rigorous use. The ball is for home use but is engineered to professional gym standards. Because of its 2000 lbs resistance, it won’t burst easily. The ball is 1877 micrometers thick and made of non-toxic PVC. The combined PVC and wall thickness gives it extra resistance to sharp objects. Sizes available are 75 cm, 65 cm, 55 cm and 45 cm. 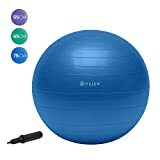 The Gaiam Total Balance Ball Kit consists of a 75 cm yoga ball, a DVD workout guide and an air pump to inflate the ball. The ball comes in three colors, purple (55 cm), green (65 cm) and blue (75 cm). All of the balls are constructed from durable rubber. These yoga balls provide health benefits, in particular, low impact, core building exercises. The ball also works out your upper and lower body, firming up your muscles and bones. If you’re not sure how to proceed, check out the DVD workout video. It’s 105 minutes long, with the workouts created by Tanja Djelevic, a professional fitness expert. The 75 cm ball is for 6’0” to 6’5” tall. Just choose one of the smaller balls if you’re under 6’0”. All the balls, by the way, are suited for Pilates as well as yoga. The Gaiam is a 52 cm stability ball designed for individuals 5’5” to 5’11” tall. Once the ball is inflated it can support up to 300 pounds so it’s going to last a lot longer than the average yoga chair. The ball may take up to 48 hours after the first inflation to reach full size, so be patient. The ball is designed to relieve back pain. Even if you don’t have backaches, the ball strengthens your muscles and bones. As a balance ball, it’s also one of the best in the market and improves flexibility. Aside from providing back pain relief, the Gaiam also keeps your spine in proper alignment. The package includes the 52 cm ball, an air pump, glide casters and a support bar. The support bar is adjustable and provides relief for aching arms, legs and back. It also leads to better posture, less back and neck pain. Ball chairs reviews have given the Black Mountain ball the thumbs-up, and it is hardly surprising. 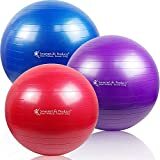 Available in red, black, blue, purple and green, the ball is designed to improve your core, physical strength and balance. The ball rating goes up to 2000 lbs and built from high-quality materials. A beginner’s brochure is included for your convenience. A pump is also provided so the ball is always ready to use. There are several size options available, 85 cm, 75 cm, 65 cm, 55 cm and 45 cm. When used regularly the ball builds up your agility and endurance. The ball’s thick wall provides durability and support. These yoga balls are designed for home, but the quality is good enough for use in the gym. If you are experiencing discomfort due to lack of activity or general body soreness, you’ll get a lot of relief from this ball. Even if you’ve never used one, the guide helps a lot. Yoga chair has been scientifically proven to give you health benefits, so it’s about time you got one. With any of the products here that’s what you’ll get in shape faster than before.